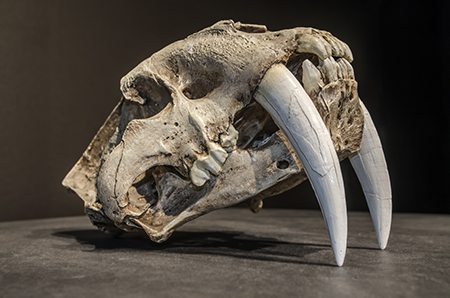 1.Smilodon: Better known as the saber-toothed tiger, it was roughly the size of a modern African lion, but much heavier. Its canine teeth could grow to be 8 inches in length, compared to lion teeth that are roughly 4 inches long. 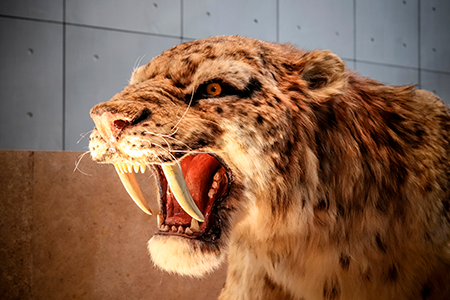 Because of the size of smilodon teeth, scientists believe it could open its jaws extremely wide. That would have made its bite strength weaker than modern cats, however. Small comfort when you consider the damage that could be done with those teeth, regardless of the smilodon’s bite strength. 2. 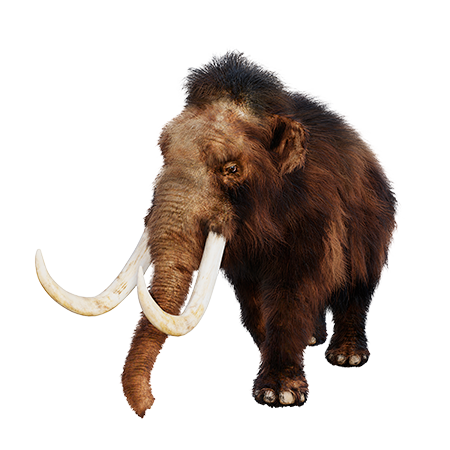 Woolly Mammoth: Woolly mammoths were comparable to modern elephants in size: about 10 feet tall from shoulder to toe. African elephant tusks are roughly 6 feet long, while woolly mammoth tusks were much longer: up to 13 feet. 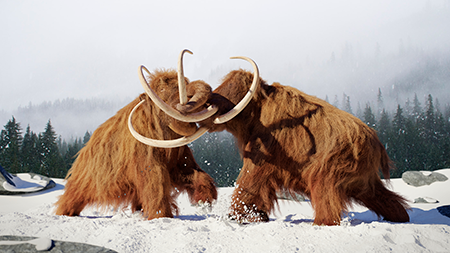 Its thick coat of brown hair—some of which could reach up to 3 feet in length—makes the mammoth stand out in our minds. The hair and extra fat with which God designed them helped them survive in cold temperatures. The appearance of woolly mammoths is well known today, because of paleoart (drawings made by humans who saw woolly mammoths alive). Also, we know what they looked like because well-preserved mammoth carcasses have been found buried in ice. 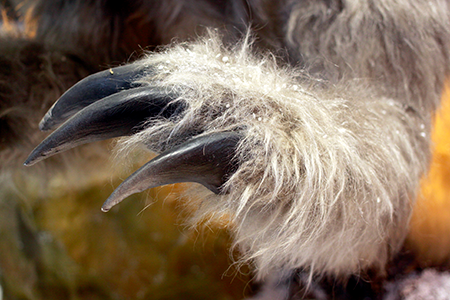 If a human took one of these hairy beasts down, he could definitely feed his family for a long time. 3. Megalonyx: More commonly known as the giant ground sloth (as opposed to modern tree sloths), it could reach the size of an ox when fully grown: 10 feet long and 2,200 pounds in weight. It was a plant-eater, also called a herbivore. 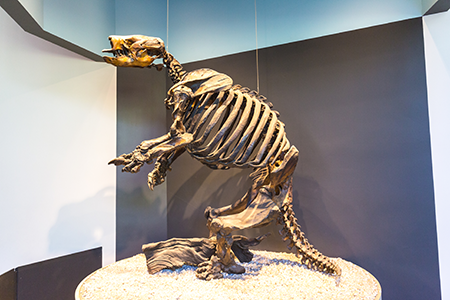 The giant ground sloth grew bigger than many bears, was able to stand up on its hind legs, and had a blunt snout that looked like it just finished headbutting the last animal to come across its path. You probably would not want to try to ride it. Like the mammoths, scientists know giant ground sloths had thick hair, because well-preserved carcasses have been discovered with their hair intact. 4. Glyptodon: While we might run over a 3-foot armadillo on the highways of Texas, it would have been the other way around in the Ice Age when you ran across a glyptodon. Although it was probably of the same “kind” as modern armadillos, it could be 11 feet long and 5 feet tall, weighing in at 4,400 pounds. That’s heavier than many cars, and it was armored like a car as well. 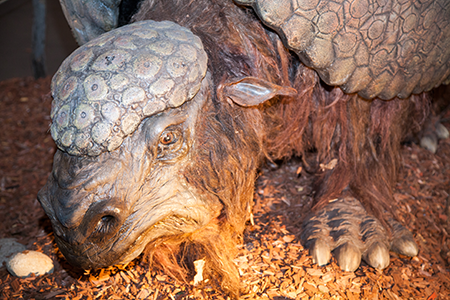 The glyptodon’s armor would have made it difficult for predators to kill and eat this Ice Age beast. The animals that existed during the Ice Age were probably more similar to those that were on the Ark. When God created all of the “kinds” of animals (Genesis 1:24-25), He created their genes with the ability to produce amazing variety within their kinds as they reproduced. From a single pair of animals could come the amazing amount of diversity that we see within the kinds today. Modern Asian and African elephants, as well as Woolly Mammoths and Mastodons are probably all part of the same kind! The Ice Age animals, however, were well-designed for a cold life. “The works of the Lord are great, studied by all who have pleasure in them” (Psalm 111:2).